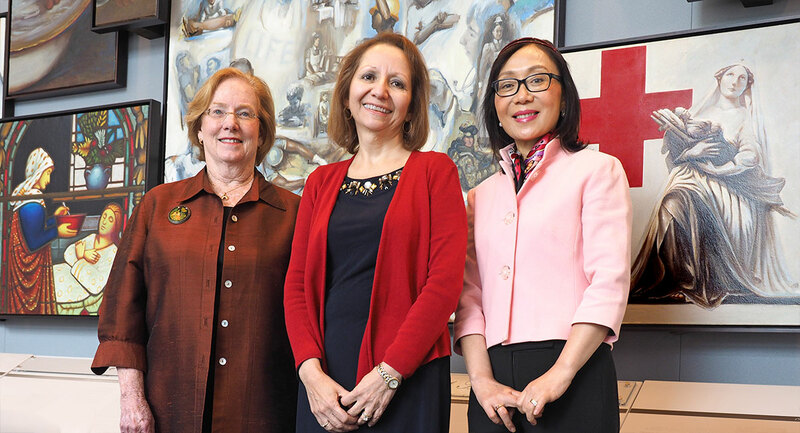 Leading the Penn Nursing School China initiatives are (l to r) Director of the Center for Health Outcomes and Policy Research and LDI Senior Fellow Linda Aiken, PhD, RN; Nursing School Margaret Bond Simon Dean of Nursing and LDI Senior Fellow Antonia Villarruel, PhD, RN, FAAN; and Nursing School Associate Professor Jianghong Liu, PhD, RN, FAAN. See larger image. 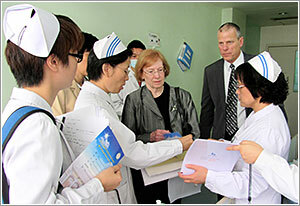 This is the second installment of the "Penn Health in China" series. 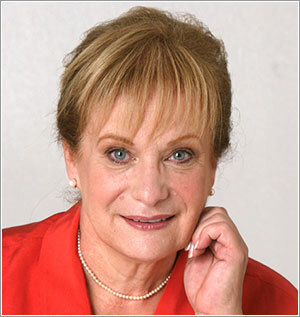 When she arrived there in 2009 at the invitation of the China Medical Board, University of Pennsylvania Nursing School Professor Linda Aiken first confronted China's unusual nursing paradox. The country simultaneously suffers a dire shortage of nurses and an equally dire shortage of paying jobs for nurses. The central government that controls and funds China's health care system hasn't created enough paying positions to employ even the nurses its various higher education facilities are graduating -- let alone the actual number of nurses ultimately required for a population of 1.3 billion people. That population's overall situation is captured in the latest comparative estimates: The U.S., which considers itself short on nurses, has 1 nurse per 100 people; China has only 1 nurse per 1,000 people. Penn's Linda Aiken and Thomas Mackey of the University of Texas Houston School of Nursing on rounds with nurses at the Sichuan University's West China Hospital in Chengdu in the southwest part of the country. The team is discussing the design and testing of a nurse-managed community service aimed at preventing unnecessary hospitalizations for diabetes-related conditions. See larger image. A third nursing-related shortage in China involved scientific research. There hadn't been any focus on the nationwide quality of care in hospitals. And yet a fourth involved the visibility and national voice of nurses -- a population of health care professionals that had long enjoyed neither. The China Medical Board -- a century old U.S. nonprofit endowed by the Rockefeller Foundation -- funds nursing educational programs in eight major Chinese universities and wanted Aiken's help in creating a nursing network that for the first time would connect nursing's key stakeholders and influencers across the country. "The Chinese government has a strategic plan for everything and all the government healthcare-related strategic plans that I looked at made total sense," said Aiken. "But there was a big gap between the plans and the reality -- and there wasn't a strategic action plan to move policy towards the goals of the strategic plans." "What I brought with me to China was pretty much what all Penn professors bring to anything: research," said Aiken, PhD, RN, who is Director of Penn Nursing School's Center for Health Outcomes and Policy Research, a Leonard Davis Institute of Health Economics (LDI) Senior Fellow, and a health services researcher internationally renowned for her health care workforce studies and expertise. "I thought the idea of creating a nursing network anchored in the eight schools could be best facilitated by doing a big national research project that would attract the attention of policymakers," she said. The Aiken-led project turned out to be a major educational program as it brought together a team of researchers from all eight universities to organize and conduct the research. One consequence of the shortage of nurses in China is that doctors outnumber nurses in hospitals and other health care facilities and beyond urban areas, the nursing shortage is even worse. "This is a major policy issue in China," explained Penn Nursing's Linda Aiken. "And it's antithetical to the World Health Organization's global recommendations, which call for countries to aim at having four nurses for every doctor. In China, the reverse is going on. Out in the community the lack of nurses makes it very hard to have ongoing programs that monitor and facilitate the functioning of the chronically ill. So China is missing the element in community care that all the other countries are working toward -- team-based community care." These nursing shortages are even more critical because of China's rapidly aging population and the legacy of the "one child" policy. Instituted in 1978, with the beginning of a phase out announced last year, the one-child policy has created a health care quandary in a society with insufficient health care providers at virtually every level. Penn Nursing's Jianghong Liu, who grew up in China, explains: "Elder care has become a very important social issue in China because married ‘one-child’ kids often have two sets of parents as well as two sets of grandparents who need to be cared for. This situation also provides an opportunity for researchers to address because China needs to identify much better ways of dealing with its elder care crisis." Liu is also involved in Penn's Fox Leadership International Program and has been facilitating connections between her colleagues in China's elderly care centers and Penn Nursing School students involved in research and service fellowships. The end result, the first such investigation of its kind in China, was published in 2012 in the International Journal of Nursing Studies (IJNS). It was a comprehensive analysis of nursing resources and organizational practices in 181 Chinese hospitals that detailed high levels of nurse burnout and dissatisfaction along with the clear association between higher quality nursing environments and better patient outcomes. A second China study that Aiken participated in looked at the inequities inherent in the country's unusual two-tier nursing workforce system. During the period from 1949 to the 1970s, candidates for nursing jobs were selected by the government and had guaranteed lifetime tenure. Later Chinese economic reforms facilitated jobs for a second kind of "contract" nurse position characterized by limited job security and fewer benefits. The study concluded that the disparities in pay and benefits between the two groups contributed to nurse dissatisfaction and the intention of many contract nurses to leave their jobs at a time when China needed to recruit -- rather than lose -- nurses. China Medical Board President Lincoln Chen and Grants Manager Linda Zhou both lauded Aiken for her accomplishments. 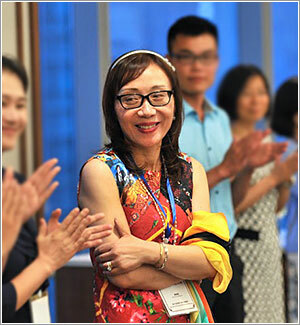 Chen cited her work as "an important support system for the top nursing schools in China" at a time when "there are too few studies of the role and impact of nurses in China." 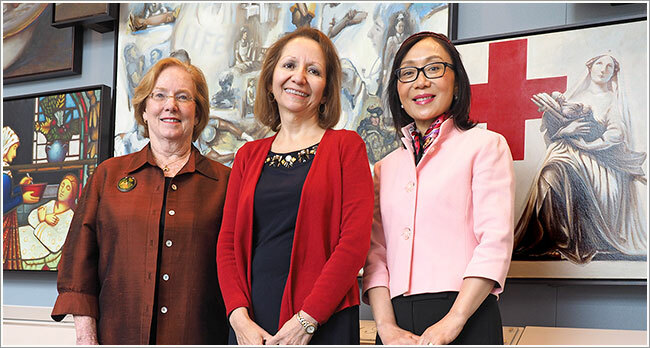 Zhou said the collaborative projects, which engaged the deans of the eight schools in the new national nursing network were "valuable to enrich the literature in nursing research and the evidence base for policymaking." Aiken, who has traveled to China more than a dozen times, is one of four faculty members who have made Penn's Nursing School a significant player in the health care-focused sector of Penn's expanding collaborative involvement in China. 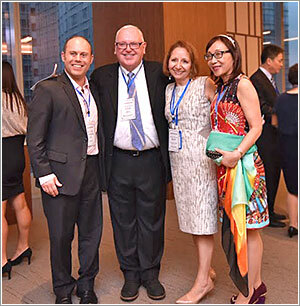 That university-wide program officially began in 2010 and established a new milestone last year with the opening of the Penn Wharton China Center (PWCC) in Beijing. The other three faculty are Nursing School Dean and LDI Senior Fellow Antonia Villarruel, PhD, RN, FAAN, who has been to China three times; Nursing School Associate Professor Jianghong Liu, PhD, RN, FAAN, who has a major longitudinal study underway in China; and Nursing School Professor Rosemary Polomano, PhD, RN, FAAN, who is engaged in a collaborative educational program that has already brought eight high-level Chinese health scholars and clinicians to the Philadelphia campus for studies in pain management. "Our school and faculty are small in size but impactful in their international interactions," said Dean Villarruel. "Linda Aiken's work in China has really been huge in a way that not many other nurse researchers across the country could have done in terms of mobilizing nursing systems in China; Rosemary Polomano, is having an impact in interprofessional training for pain management and will be in China this Fall; and Jianghong Liu has an NIH-funded study that has been underway in China for years." 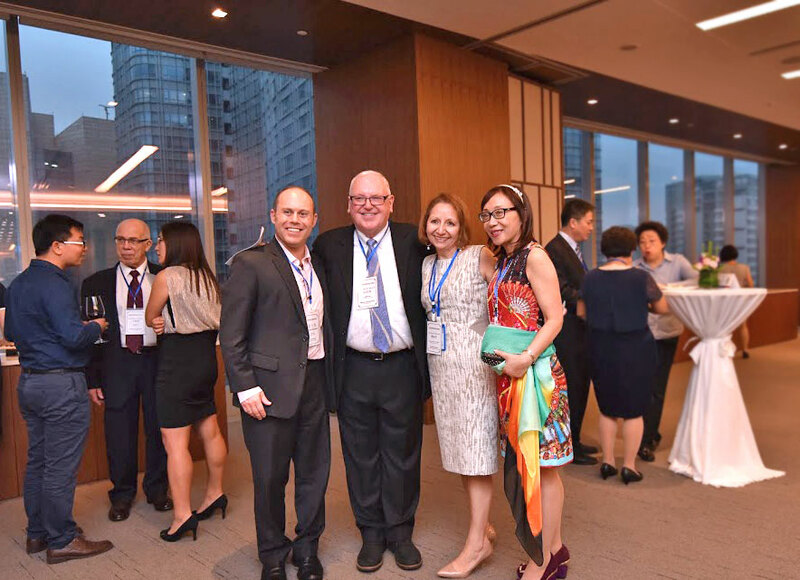 At the Penn Wharton China Center 2015 anniversary event in Beijing are (l to r) PWCC Managing Director Jeffrey Bernstein; Dean of the Barnes-Jewish College Goldfarb School of Nursing, Michael Bleich; Penn Nursing Dean Antonia Villarruel; and Penn Nursing professor Jianghong Liu. See larger image. 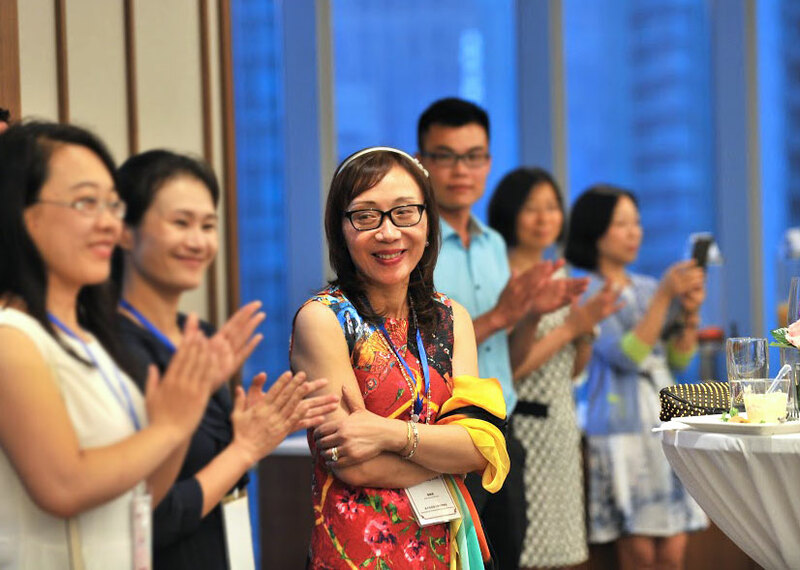 Liu -- the Nursing School's only native Chinese faculty member -- grew up in Jiangsu Province and received her initial training in nursing at Nanjing Medical University before coming to the U.S. twenty years ago. She earned her MS in maternal-child health nursing and PhD in interdisciplinary nursing at UCLA and did postdoc work on child development and psychopathology at USC. Early in her education in the U.S., Liu became fascinated by the landmark work of Penn alumnus and Harvard researcher Herbert Needleman, who, since the 1970s, had been the leading national expert on the toxicity of environmental lead exposure. His 1996 study linked bone lead levels to teenage delinquent behavior. He wrote that lead is "a brain poison that interferes with the ability to restrain impulses." During her postdoctoral research training, Liu had a mentor who was a researcher involved in generation-to-generation longitudinal studies on how early risk factors impact long-term health outcomes. “I told my postdoc mentor I wanted to do a study and that resulted in the idea for a project that was both longitudinal and about lead exposure -- back in China." In 2004, Liu selected the medium-sized industrial city of Jintan for her study of early lead exposure effects among 1,600 kindergarten children. The city is about 100 miles northwest of Shanghai in the eastern end of the country. 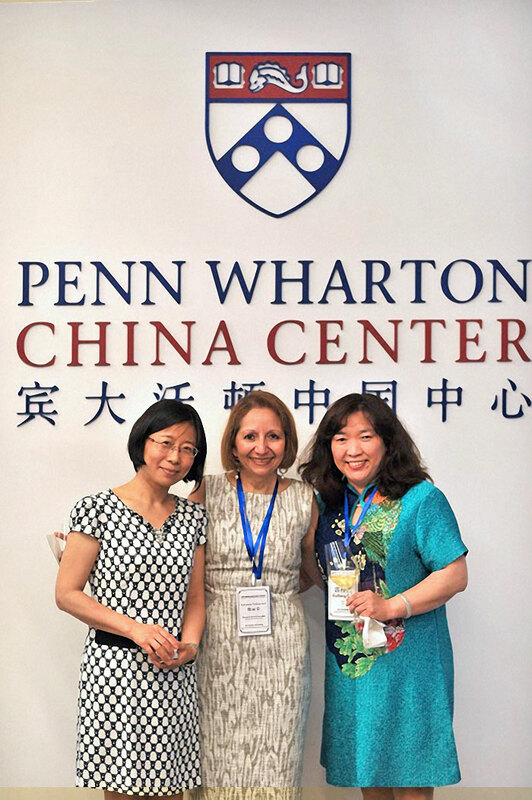 Penn Nursing's Jianghong Liu at the Penn Wharton China Center where she helped organize a nursing seminar. See larger image. In 2007 she joined Penn's Nursing School where she now teaches courses including "Environmental Toxicology: Risk Assessment and Health Effects." For the last ten years, her Jintan study has been funded by NIH grants. Jintan, whose industrial base includes the manufacture of cement, electronics, chemicals, auto parts and clothing, is a relatively small Chinese city. It did not have the overwhelming pollution levels of larger industrial centers like Beijing or Shanghai and was, hence, more typical of conditions across most of the country. "Back when I started, Jintan's size, location and socio-economic mix were a good fit for my study," said Liu, who is the primary investigator on the project officially known as the China Jintan Child Health Project. "Jintan was growing fast and facing many of the same industrial and socio-economic changes as the rest of China." Every year, Liu spends the summer in her Jintan lab where she and her staff continue to assess the children who became part of the study a dozen years ago when they were between 3 and 5 years old. To date the Jintan project has found what other studies established -- that lead exposure decreases children's IQ and causes various sorts of other biological damage. "In Jintan we compared low level kids and high level kids and found high level kids to have more behavioral problems and emotional problems," she said. "We also recently found that they have more sleep-related problems. We are the first to report the sleep aspect of the problem." "All of these findings have implications for nursing in both China and the U.S.," Liu said. "Nursing is increasingly concerned with disease prevention and health promotion and nurses are in a good position to teach parents about healthy lifestyle and child rearing habits as well as ways to reduce their children's exposure to environmental toxins like lead." 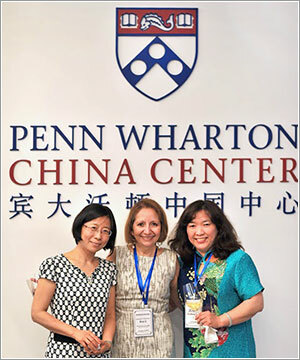 At the Penn Wharton China Center in Beijing are (l to r) Qian Lu of the Peking University Health Science Center School of Nursing, Penn Nursing Dean Antonia Villarruel, and Guifang Guo, Dean of the Health Science Center's School of Nursing. See larger image. Liu said that it's only been in the last decade the Chinese government has begun to increase health-related research funding at the national level and many of the scientific supports that are routine in the U.S. are not always available in China, making work more challenging for scientists. "Public awareness of environmental health issues in China has only happened very recently in the past decade, partially due to accumulated evidence over the years of the effects of industrialization and importantly, people become aware through media and social media reports." "It was previously very difficult to access public and standardized data related to environmental health,” Liu explained. “It seems that the Chinese government is now investing in big data access for the public. For example, recently the Chinese Academy of Sciences and the Natural Science Foundation of China enacted policies that will make their research available to the public. Hopefully China continues to invest in making research openly accessible. " Liu, who has been mentoring undergraduate, graduate students and visiting scholars from China, said one of the reasons she enjoyed being involved in that training is because "they go back with a different perspective about the science of health care. For example, they understand the great benefit of standardized health data and as they eventually move up into important positions, they can use their knowledge to improve China's systems." The University's Penn Global office has recently awarded Liu funding to organize and teach a multidisciplinary seminar entitled "Environmental Health Issues and Global Implications." The campus-anchored spring course for 14 U.S. Penn students will include an additional two-to-three-week field trip to China in collaboration with Shanghai Jiaotong and Southeastern universities there. The students will be interacting with Chinese environmental health researchers as they get hands-on experience in testing air and water pollution. Nursing School Professor Rosemary Polomano, PhD, RN, FAAN, hosted eight visiting Chinese nurses and physicians in her pain science course on the Philadelphia campus. This falll she heads to China for the first time to undertake the second phase of the project in collaboration with Penn Medicine faculty members. The goal of the two-year project is to involve teams from both Penn and a variety of Chinese Universities in an exploration of the most effective ways to improve preoperative pain care in China's hospitals. Project activities occur in both the U.S. and China. In the first phase last year, eight Chinese scholars -- nurses and physician specialists in pain management and anesthesiology -- spent two weeks on Penn's Philadelphia campus attending Polomano's "Pain Science and Practice Interprofessional Pain" Nursing School course. "The interprofessional experience was very unique to them," said Polomano. "All of them were partnered with dental students and pharmacy students, which is not typically the way they learn in China." An intense schedule had the Chinese visitors in class as well as on rounds of clinical observations and interactions in several of Penn's hospital facilities. Later this year, Polomano will be traveling to China as another phase of the program gets underway with a team of other Penn faculty members from Penn Medicine. The goal is to jointly envision research projects that would provide insights into how to best establish standardized clinical methods to advance perioperative pain management care. "The important thing about this project is that we have not designed a research study that will be carried out there in China," said Polomano. "Rather, we are engaging our Chinese colleagues in the design of a practice-based study at two Chinese hospitals with Penn faculty supporting the projects in keeping with Chinese culture and health care settings. This is what makes it unique." And what's the future for the Nursing School's overall China involvement? Dean Villarruel was asked. "We want to build on the work of our scholars here," she said. "We're also exploring other China opportunities with Penn Medicine. The goal is to find collaborations that advance both our science and our practice as well as that in China. And I think that's going to take some time to develop." Is there anything that U.S. health care can learn from China's current system? "The answer is yes," Villarruel said. "When I visited various areas and schools in China, I was struck by their use of alternative medicines or therapies and wondered if we CAN learn more about these. The Chinese have been using some of these methods for a very long time and have had some good outcomes in chronic care conditions, like pain management. There could be lots to learn by trying to understand how they work."